Keep your family safe and healthy with non-toxic PEVA shower liners. The greatest danger in your bathroom could be your new vinyl shower curtain. The EPA found poly vinyl chloride (PVC) products are laden with 108 volatile organic compounds and poisonous chemicals that emit toxic gas into the air which can persist for the first 28 days. PVC plastic is softened with hormone-disrupting phthalates and includes chlorine which creates dioxin, a carcinogenic chemical formed during its creation and destruction. Dioxin is dangerous since it easily penetrates the food chain of the planet as it can travel widely without breaking down. A recent study found that in just six hours after opening a PVC shower curtain, your bathroom would be exposed to volatile organic compounds over 16 times the allowable levels for indoor air quality established by the US Green Building Council and the Washington State Indoor Air Quality Program. Bottom Line: Be wise and don't put your family at risk with poly vinyl chloride (PVC) shower curtains. Purchase today and get free 2-day shipping for Amazon Prime customers by clicking Add to Cart. SAFE & ECO FRIENDLY - Many low quality shower liners available on the market are made from PVC, a highly carcinogenic compound that emits toxic gas into the air which can last for 28 days. Our shower liner is made with non-toxic, chlorine free, PEVA which doesn't expose your family and the environment to harmful chemical fumes. CONVENIENT - Easily fits any standard size shower/tub and works with straight or curved shower rods. 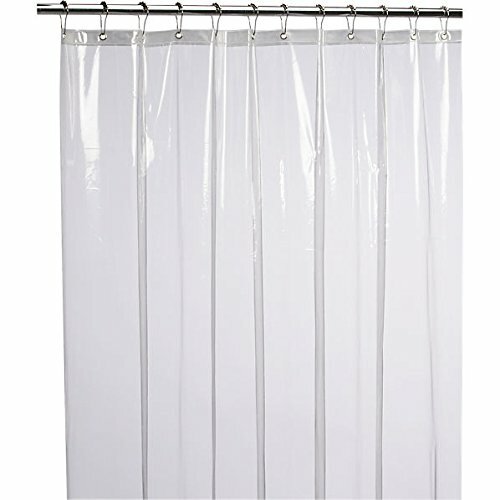 Use it as a stand alone curtain or as a liner for a cloth shower curtain. Heavy Duty magnets on the bottom prevent curtain creep keeping the water in and the cold air out. CLEAN & GERM FREE - Our high quality anti-bacterial curtain inhibits mold and mildew growth. With basic maintenance of rinsing and wiping, be free of unhealthy and embarrassing mildew buildup and confident knowing that we offer a 12 month warranty against mildew and mold build-up. NO HASSLE GUARANTEE - Includes a 12 MONTH WARRANTY with our 90 day "No questions asked" money back guarantee! DURABLE - Rust proof metal grommets allow for easy sliding and pristine "new" look. Reinforced grommet header prevents tearing and insures long term use of our 100% waterproof liner. If you have any questions about this product by LiBa, contact us by completing and submitting the form below. If you are looking for a specif part number, please include it with your message.